This book proposes a framework for comparative analysis of the relation between the media and the political system. 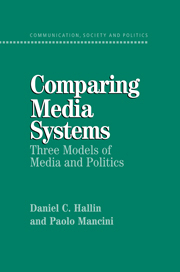 Building on a survey of media institutions in eighteen West European and North American democracies, Hallin and Mancini identify the principal dimensions of variation in media systems and the political variables that have shaped their evolution. They go on to identify three major models of media system development, the Polarized Pluralist, Democratic Corporatist, and Liberal models; to explain why the media have played a different role in politics in each of these systems; and to explore the forces of change that are currently transforming them. It provides a key theoretical statement about the relation between media and political systems, a key statement about the methodology of comparative analysis in political communication, and a clear overview of the variety of media institutions that have developed in the West, understood within their political and historical context. Daniel C. Hallin is a Professor of Communication and an Adjunct Professor of Political Science at the University of California, San Diego. He has written widely on media and politics, including studies of media and war, the shrinking soundbite in television news, the history of professionalism in American journalism, and the media and the process of democratization in Mexico, as well as earlier studies of U.S. and Italian news with Professor Mancini. His previous books include The “Uncensored War”: The Media and Vietnam and We Keep America on Top of the World: Television Journalism and the Public Sphere. His articles have appeared in the Journal of Communication, Political Communication, Media Culture & Society, the Journal of Politics, and the Columbia Journalism Review, among other publications, and have been translated into many languages. He has served as editor of The Communication Review and as an at-large board member of the International Communication Association. Paolo Mancini is presently a full professor at the Dipartimento Istituzioni e Società, Facoltà di Scienze Politiche, Università di Perugia. He is also the Director of Centro Interuniversitario di Comunicazione Politica (Interuniversity Center of Political Communication). He received his Laurea degree from the Facoltà di Scienze Politiche and his Dea at the Ecole des Hautes Etudes en Science Sociales of Paris. Professor Mancini went on to teach at various institutions in Italy and abroad including the University of California, San Diego, and Università di Perugia and was a Fellow at the Shorenstein Center on the Press, Politics, and Public Policy, Harvard University. Professor Mancini is the author of a number of books including his most recent, Il sistema fragile (2000). With David Swanson he edited Politics, Media and Modern Democracy. Professor Mancini is also corresponding editor of many journals including European Journal of Communication, Press/Politics, The Communication Review, Political Communication, and Journalism Studies. Politics and relations among individuals in societies across the world are being transformed by new technologies for targeting individuals and sophisticated methods for shaping personalized messages. The new technologies challenge boundaries of many kinds – between news, information, entertainment, and advertising; between media, with the arrival of the World Wide Web; and even between nations. Communication, Society, and Politics probes the political and social impacts of these new communication systems in national, comparative, and global perspective. We don’t remember exactly when the idea of this book was born. Probably at the moment we were finishing our first joint enterprise, “Speaking of the President,” which was published in 1984, we already had a strong sense that this kind of research was extremely promising and that we should try to do it more systematically and on a broader scale. Little by little, through other experiences of comparative studies on particular subjects, we conceived the idea of this project. Briefly, what we have set out to do is to find out whether it is possible to identify systematic connections between political and mass media structures. We were curious, in particular, whether it made sense to think in terms of distinct models of journalism and of the media-politics relationship. This has been an ambition in the field of communication since Four Theories of the Press, and it also seemed to us, as we began to survey the variety of media systems in Western Europe and North America, that there really were clusters of media system characteristics that tended to co-occur in distinct patterns. We introduce a schema centered around three models of journalism and media institutions in the pages that follow – though with plenty of qualifications about the variation that exists within and between actual media systems belonging to these three models. We have tried to carry out this effort at comparative analysis empirically, without having in mind any ideal professional model of reference against which other systems would be measured – eschewing the normatively centered approach that, as we will argue in the pages that follow, has held back comparative analysis in communication. At the same time, we will try in this book to assess weaknesses and strengths of each media system model as a support for democracy; this much of the normative orientation of communication theory is certainly worth maintaining. For methodological and practical reasons that we explain in the following text, we chose to confine this study to a limited set of countries that have much in common in terms of their history, culture, and institutions, those of Western Europe and North America. We do believe that much of the analysis will be of interest to those studying other regions, and we will say a little about how we see our models in relation to the rest of the world; we will also stress that we don’t intend any of this analysis simply to be applied to other systems without modification. Our experience carrying out this project was genuinely exciting: We discovered interesting peculiarities we didn’t expect, and similarities appeared where we had expected differences. We enjoyed stimulating discussions with colleagues in different parts of the world. We challenged our linguistic abilities, and spent many hours trying to interpret one another’s drafts and forge our separate ideas into a single, coherent argument. (We know that university review committees sometimes believe that co-authoring a book is only half as much work as writing a single-authored one, but we can assure them that this is not the case!) This book was written partially in San Diego and partially in Perugia. Jet lag was a common challenge, and long transoceanic flights were often the occasion for new ideas and improvements. In the end we don’t claim to have presented a fully finished analysis; the state of comparative study in communication is too primitive for that, both conceptually and in terms of available data and case studies. We believe we can offer important results, but more than anything else we think we have been able to point to possible areas and strategies for future research. The “official” beginning of the project was a conference organized in Berkeley in 1998; during and since that seminar we have taken advantage of the suggestions of many colleagues and the help of several institutions. We would like to acknowledge their help here. The University of California, San Diego, has supported both of us with travel grants and teaching opportunities that were important occasions for discussing and writing this book. The Center for German and European Studies of the University of California, Berkeley, made possible the organization of the 1998 conference, as well as funding some of our content analysis and a graduate seminar we taught jointly at the University of California, San Diego. Grants from Università di Perugia, progetti d’Ateneo, provided additional resources for traveling. A grant from RAI, Radiotelevisione Italiana, made possible the collection of much of the documentary data. A seminar organized by the Institut für Journalistik at the University of Dortmund in connection with the Erich Brost Stiftungsprofessor provided an important opportunity for discussion of some of our early results. A visiting professorship at the University of Düsseldorf, funded by the Deutsche Forschungsgemeinshaft and organized by Professor Karin Böhme-Dürr, provided important opportunities for research, as did a United States Information Agency (USIA) Academic Specialist grant for travel to Greece. Meetings organized at the Universidade Nova de Lisboa, the Universidad Complutense de Madrid, and by the Journalists Union of Macedonia and Thrace were also very useful. Stlianos Papathanassopoulos, Ralph Negrine, Winfried Schultz, Wolfang Donsbach, José Luis Dader, Michael Gurevitch, Peter Humphreys, Erik Neveu, Katharina Hadamik, and Gerd Kopper attended seminars during which we discussed our project, and they have been very helpful in providing both information and critiques of our ideas. We bored other colleagues in various parts of the world asking them to read parts of the book and to correct our mistakes. The reactions of Peter Humphreys, James Curran, Lennart Weibull, Raimo Salokangas, Robert Hackett, Winfried Schultz, Kees Brants, Jay Blumler, Stylianos Papathanassoupolos, José Luis Dader, Isabel Fernández, and Erik Neveu to our drafts have been very useful. We asked many colleagues to help us with information we lacked about particular countries. In addition to those we have mentioned, we received help from Els de Bens, Monika Djerf-Pierre, Tom Olsson, Jan Ekecrantz, Yuezhi Zhao, Rudi Renger, Nelson Traquina, Eric Darras, Yoram Peri, and Sigurd Høst. At various times we discussed the content of this book with Cees Hamelink, Peter Dahlgren, Kaarle Nordenstreng, Klaus Schoenbach, Rod Benson, Partick Champagne, Dominique Marchetti, Holli Semetko, and J.M. Nobre-Correia. Raquel Fernández, Llucia Oliva, Juan Diez Nicolas, and Maria-Teresa Cordero were very helpful in arranging interviews in Spain. Many journalists, media regulators, and others in a number of countries were also willing to give their time for our questions. Rod Benson and Mauro Porto did the coding and helped to develop the content analysis reported here. Alain Cohen and Ferruh Yilmaz provided help with translations.